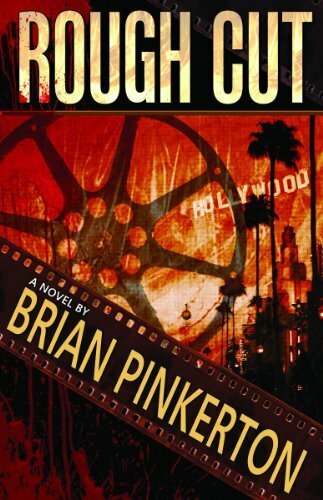 DarkArtsBooks » Now on Dark Arts Books: Brian Pinkerton’s ROUGH CUT! Now on Dark Arts Books: Brian Pinkerton’s ROUGH CUT! Six years ago this month, Roy Robbins, the publisher of Bad Moon Books, reached out to me to see if I’d be interested in designing the cover for fellow Chicago horror writer Brian Pinkerton. I said possibly, let me take a look at the manuscript. And when I read it… wow. I couldn’t wait to do the cover. Rough Cut is seriously one of my favorite horror novels that I’ve read in the past ten years. And it inspired one of the best book cover designs I think I’ve done. So… a few weeks ago when Bad Moon phased out the last of their original book line… I was super excited when Brian agreed to have Dark Arts Books take on the paperback edition of Rough Cut. (Crossroad Press currently publishes the e-book edition). I’m proud to have had anything to do with this novel… and I’m excited to be able to bring it to more readers. Horror legend Harry Tuttle is desperate for a hit. Harry’s career has been on a painful slide ever since he directed a couple of box office winners in the 1980s. Enter Marcus Stegman, a young unknown with a horror picture of his own. It’s not only a brilliant debut — it’s the movie Harry always dreamed of making. A rivalry ensues — and it’s about to become bloody. A suspicious film critic, beautiful young starlet, and deranged fan become entangled in the cut-throat competition where hungry hopefuls will go to any means necessary to break into the big-time…and no one is safe. Read Rough Cut… NOW! You can thank me later. This entry was posted by John Everson on Monday, January 23rd, 2017 at 10:22 pm	and is filed under Uncategorized. You can follow any responses to this entry through the RSS 2.0 feed. Responses are currently closed, but you can trackback from your own site.